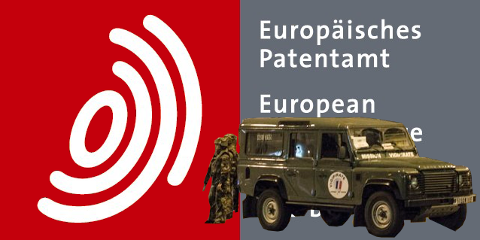 Benoît Battistelli is embarrassment to the EPO. He does to the image of the EPO and the European Union what Blatter did to the reputation of FIFA and UEFA. Benoît Battistelli is once again (as in many times in the past year) exploiting terror attacks (warning: epo.org link) to pretend that he’s anything other than a thug, or a bully who terrorises staff, terrorises lawyers, terrorises delegates, and even terrorises bloggers. What a total hypocrite. This is a typical routine of his, after every major terror attack (we covered other such examples in the past). This helps boost/feed the fictitious narrative of urgent need for 6 bodyguards [1, 2, 3] and makes it seem like he’s the “defensive” party. What next? Will he be strutting around with a plaster across his face like Blatter did? Cosby too used such strategies to garner sympathy. Are these blog posts written with advice from FTI Consulting? Maybe ghostwritten by the PR team? These have been written since the initial FTI Consulting deal. Is Battistelli sitting up there in his office near the Isar waiting for the next terror attack so that he can write blog posts and ‘private’ letters (opportunistically published to the whole world), painting him as sympathetic and caring? The latest is being sent to the head of the USPTO, a terrible patent system with no real quality control and a lot of patent trolls (i.e. what Battistelli strives for with the UPC). There is hardly any connection between her and the victims. She probably lived in the West Coast and is of East Asian decent, whereas the attack happened in the (South) East Coat and mostly killed Latinos. But never mind all that; terror attacks are always convenient excuses for policy-pushing (gun control, foreign policy etc. ), especially for politicians like Battistelli. He’s not a scientist, he's a politician, which in itself is a problem. This could disqualify him if not rationalise impeachment. A partial explanation… Grants actually reflect work done 7-8 months previously as the decision to grant is based on the intention to grant delayed by time for translation and any amendments. Thus the current ‘surge’ is actually a surge taking place in early 2015. That relates to a time when Early Certainty From Search started and examiners dossier management system prioritised search over examination. With one exception! Grants could be made immediately even if they were low ranked and the system identified files which were possibly ready for grant based on the info supplied for ESOP or WOISA. In order to reach targets examiners thus took this option and, in effect, non-grantable files became secondary at best. Priority was search and grant. Examination had to wait for search deadlines (priority 1) to be met. This may change soon so the apparent surge may not continue. Indeed, at some point examiners will have to do the examinations as priorities will change. But in the meantime the examination work is skewed to grant rather than further communications, even if the applicant has amended and feels it is ready for grant the examiner must deal with highly ranked files – legal search deadlines etc. – first and is not allowed to choose lower files. Meanwhile, the EPO’s Twitter account (i.e. PR people) is still milking the staged events and linking to puff pieces like this one. Applicants’ money is apparently being wasted by the millions on a silly festival rather than a thorough/comprehensive/exhaustive patent search (for prior art). Cutting corners to improve the bottom line in the short term seems like ENA ideology. If Battistelli manages to survive until the end of his term, why worry about the mess he leaves behind him? It’s like a 4- or 8-year presidential cycle, where one typically leaves the bubble for successors to grapple with as it implodes. “Grossenbacher has earned quite a negative reputation, for reasons we named here before. Some suspect he is also the reason Brimelow stepped down and made room for Battistelli.”EPO and Battistelli are busy wasting a lot of money on a lobbying event, dressed up as an award ceremony or science. Here is Battistelli writing about his lobbying event (warning: epo.org link) which took place one week ago. This event, which he spent millions of Euros (EPO budget) on, will “continue to assert itself as the ‘Nobel prize’ of innovation,” according to Battistelli’s blog post. So he thinks he’s Nobel again, having said something to that effect at the event as well (we covered this at the time). Megalomania at work? We have already mentioned it here the other day, as it’s clearly an attack on appeal rights and hence on the boards. Patent quality would be severely damaged. That was a cornerstone of the EPO and it was how the high costs (fees) were justified for decades. These fees are presently being wasted by Battistelli, who is buying the media to control the message (improve an image) rather than improve the Office. To the tune of millions of Euros, Battistelli flushes money down the toilet because the image of the EPO remains tarnished. Personally, I have always seen the dead hand of Eminence Grise Roland Grossenbacher (or ‘Roland’ as BB warmly refers to him in meetings of the AC) in all this. He has led the hawkish element in the AC ever since he became head of the Swiss delegation and if there is any concertation involved in the various measures introduced by the BB regime, he is at least the arranger, if not the bandmaster. This is not to say BB is his creature: I think Benoît is now beyond anyone’s control. But Roland must be viewing the present mayhem with a certain satisfaction. “If an ordinary CEO had done [what Battistelli did] in the UK,” one person commenter, “he would have committed a criminal offence” (laws don’t apply at Eponia, Battistelli makes them up and changes them whenever he pleases). Truly astonishing. If it can be proven that there was a “threatening” letter, then it is hard to see how that could amount to anything other than an attempt to pervert the course of justice. If an ordinary CEO had done this in the UK, he would have committed a criminal offence that carries a maximum sentence of life imprisonment. Regardless of the semantics, the AC needs to act now, even if they have arguably been complicit in bringing this situation about. On this occasion, the president has unarguably overstepped the mark (and in a serious way). Given that the president has also taken other actions that are directly contrary to instructions given to him by the AC, then what choice does the Council have but to give him his marching orders? There would appear to be no options for “finessing” this situation so that business can carry on as normal.